Paper Cage was made for my final MFA degree show and is now part of a growing collection of installations entitled ‘Cages’. This particular piece is highly personal as it contains a lot of my own mental and emotional trauma, struggles, experiences and thoughts. It is inevitably Expressionistic, and cathartic for me to create. Paper Cage chronicles a psychological journey to understand emotion within the unconscious memory. I expose the significance of emotion and how it affects one’s perspective on life. I am especially interested to see how fear and angst when internalized can have massive repercussions on the individual’s choices and behavior. I am also fascinated in psychosocial issues and what can be gleaned about our environment through the mentality of the individual. I focus on aesthetics and decoration and look at how patterns, whether they are visual, symbolic, historical, psychological or cultural, reflect mindsets of the time. Images and words can represent collective ideas of status and rules. How do they impact the individual and their social belonging within a community? I love the fragility of paper and hand cutting it allows me to have a close relationship with what I make. I represent myself and people I know within my art to depict segregation, isolation and anxiety. My wooden and paper constructions are essentially cages, which are domestic in appearance; yet allude to larger structures that are social and mental. These ‘invisible’ cages contain a deep and intricate system of microcosms, myths, language, and relationships between the private and public. They act as links and barriers between the individual and the other. In Chinese tradition paper cutting was used as a celebration. Physically they are very delicate things; yet contain powerful symbols and words that supported a belief system of luck and prosperity. The dark side of this is that it is deeply entwined with the superstitions and control of the Chinese authority, mindset and culture. So what appears beautiful and harmless on the outside may have severe undercurrents. 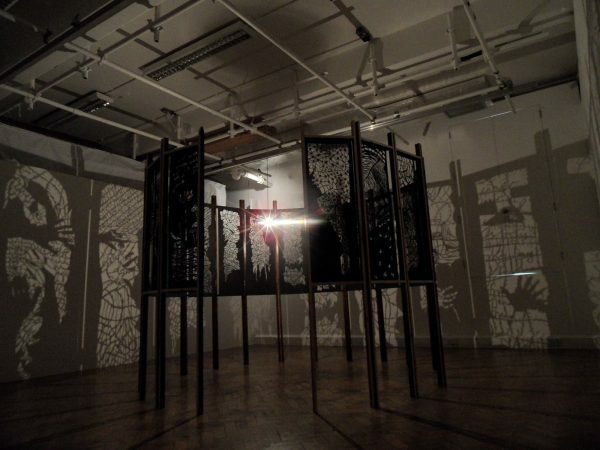 Paper Cage is immersive and experiential, and was made very much for a gallery audience. Although it is about alienation it is ultimately a humane and empathic artwork that seeks compassion, harmony and connection.